Citing many positive trainers’ shared preference for non-aversive, force-free harnesses over head halters—and, of course, over choke, prong, and shock collars—the article discusses the advantages of front-clip harnesses. Those advantages include “allowing a small or physically challenged person to safely walk a hard-pulling do” and avoiding pressure on a dog’s trachea. 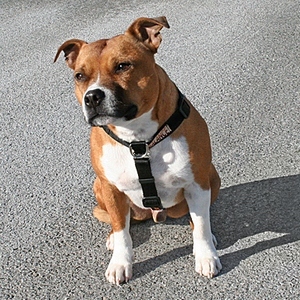 Assuming a careful and proper fit, a front-clip harness is considered the ideal training tool to teach polite leash-walking.